The torch-lighting ceremony in Paris, disrupted by protests highlight the still-contentious controversy of Tibet’s relationship with China. A cause of activists for years, pro-Tibetan demonstrators argue that the Chinese government’s heavy-handed policies and treatment of Tibet result in gross human rights violations, including unfair imprisonment, torture and death. Such troubling events could make Tibet a questionable destination for your next trip. After all, many businesses in Tibet are Chinese-owned and operated, so the perceived “modernization” of Tibet can be arguably benefiting China at Tibet’s expense. The Lonely Planet’s Tibet entry is a great guide that will ease a lot of the discomfort potential travelers may have when considering Tibet for their vacation. Besides a letter in the preface by His Holiness the Dalai Lama, the authors – Bradley Mayhew, Robert Kelly and John Vincent Bellezza (there is also a contributing author credited, Tsering Shakya) – take great pains to highlight Tibetan businesses and they make a point of encourage readers to patronize local Tibetan vendors, merchants and businesses. As expected, there are important phrases translated – mainly greetings and what would be useful to say when ordering food. The phrases are in Mandarin and Tibetan, including tips on pronounciation. 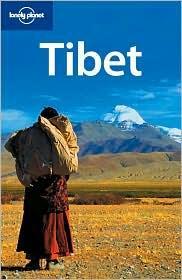 Lonely Planet follows the series’ format, which gives readers an easy-to-read how-to of visiting Tibet. A debit of the format is the paucity of photographs – there are thirteen pages of color photos – one page dedicated to the authors, and though the men are pleasantly handsome, more pictures of temples, cities, or monasteries would be preferable. In lieu of photographs, we get excellent descriptions of the various sites suggested. The prose is clean, simple and at times, humorous (they warn readers that the abundance of monasteries can cause “Buddha-burnout”). The descriptions are useful because they will let the reader know if a site is particularly difficult to reach (or in a lot of cases, climb). The names of points are in bold print, so you can spot quickly what you’re reading about and it also makes it easier to quickly spot a certain landmark on a page. Along with the usual “where to go” tips, the book also devotes sections to culture and history. These parts of the book are especially important because they not only clue the readers in on the behaviors and customs of the locals, but also give context to the political struggles facing Tibetan people today. While surprisingly comprehensive in its dealing with the history of the conflict between China and Tibet, it would be a mistake to make this book the sole source for those interested – instead, the guide should act as a supplement to books, articles and other new sources on the subject. One thing becomes very clear when reading this guide: Tibet is definitely a “roughing it” vacation destination. The storied Mount Everest as well as the less-celebrated Mount Kailash and Mount Meru all earn cautionary descriptions that include suggestions of various modes of transport (much of it arduous, difficult and character-building). Tibetan cuisine is also prefaced with a concession that gourmets and foodies won’t list the country among the gastronomic capitals of the world (yak-butter tea, a particularly distressing mixture of yak butter, salt, milk, soda, tea, and water gets its own section – as well as a warning label). Tips on what and how to pack are included as well. A challenging trip to an exotic locale like Tibet requires special care dedicated to packing – the climate, terrain and environment require appropriate clothing, luggage and various equipment (including water-purifiers to prevent dreaded diarrhea. These tips are great, especially for adventure-neophytes who have no idea what they’re getting themselves in to (for example, did you know that in flight to Lhasa, a can of instant coffee and explode due to pressure changes?). For most, Tibet means the Dalai Lama, yaks, monks, and Mount Everest. For the more politically sophisticated, Tibet is a topic of hot debate. However, there is so much more for a prospective traveler to see. An important note the authors, and the Dalai Lama, make is that traveling to Tibet is an excellent way to cross and break cultural borders and prejudices. In light of the problems facing the Tibetan population and its valiant effort to preserve its culture, a deeper understanding of the country is sorely needed.